It’s been almost two months since I worked on revisions for Cherry Bomb, the novel an agent has shown interest in. When I emailed the agent and told her of my situation, she wrote back immediately, expressing concern for my well-being, encouraging me to take care of myself, and that she would be excited to read my revisions whenever I could get back to the novel. So, I’m not feeling pressure from her, but it’s so difficult not to be writing. What’s stopping me? Physical and mental energy. 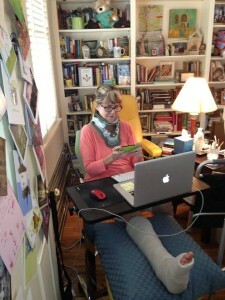 I can sit up and work at my laptop for an hour or so at a time now, but then my leg and/or neck hurt, or my lower back. Or my mental energy runs out. This is such a new experience for me—I’ve always had an abundance of physical and mental energy. In the meanwhile I’m trying to strengthen my writing muscles with blog posts and reading. I was inspired by Richard Gilbert’s post, “In Praise of Reading,” on Monday. Although I wasn’t able to read for the first two weeks after my accident, I’m thankful that over the past month I’ve been able to read two wonderful novels and part of a memoir, all three of which I’m reviewing on my blog in September. It definitely feeds my craft to read finely written prose. 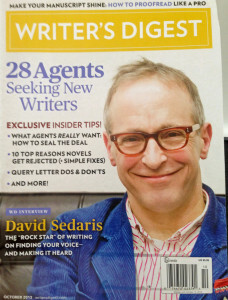 I’m also feeding my craft through some wonderful articles in the October issue of Writer’s Digest Magazine. Whether you are new to the craft or already published, there’s lots of great stuff in this issue. I have writing buddies who have asked me questions recently that are answered extensively in this issue, so I can’t recommend it highly enough. On writing rituals: And so I sit down every morning, and I make sense of the world—and I don’t let things get in the way. On finding your voice: Well, I think I was like everybody in that I found my voice by imitating other people. You just try on other personas. I wrote like Joan Didion for a while, and I wrote like Raymond Carver for a while—strong stylists…. We stir it up, and it’s the combinations, I think, of this and that, that make us who we are. Reason#1: It’s not what was promised. Reason #2: It’s wrong for the genre/audience. Reason #3: The story lacks authenticity. Reason #4: The manuscript falls to pieces. Reason #5: It takes you too long to get on with it. 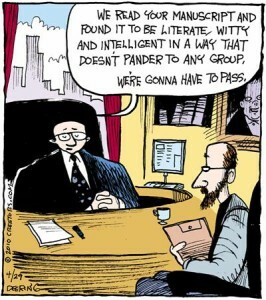 Reason #6: The writing lacks confidence. Reason #8: You haven’t made me care. Reason #10: It’s just not strong enough. You’ll have to read the article to learn how to fix these problems! And the author (a literary agent) has some good advice for making those fixes. Wherever you are in the writing/publishing process, I wish you all the best! Thanks so much for reading, and for your good thoughts, Shellie!